These are three mangos on a old oak table. 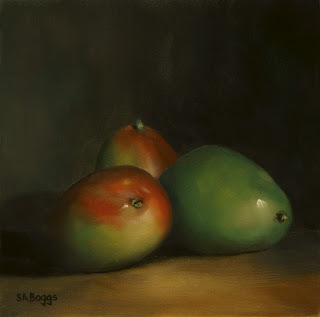 I had painted mangos only one other time many years ago as part of a larger composition. This is the first time that I have painted them as the solo attraction in a painting. I really liked the bold and subtle variance in colors. I selected the green mango to add a contrast to the more colorful ones. I hope that you enjoy the painting!